Investors seeking to diversify their portfolio by acquiring student housing assets can dip their toe into the market, acquiring a single property – or go bigger, investing in a portfolio of properties. When investing in a student housing portfolio, not only are the stakes higher, but both the acquisition process and resulting asset management process require more significant bandwidth from a larger team of experts to ensure a uniform, high quality, thorough process at every asset. When constructing a student housing portfolio, the following considerations should be top of mind. 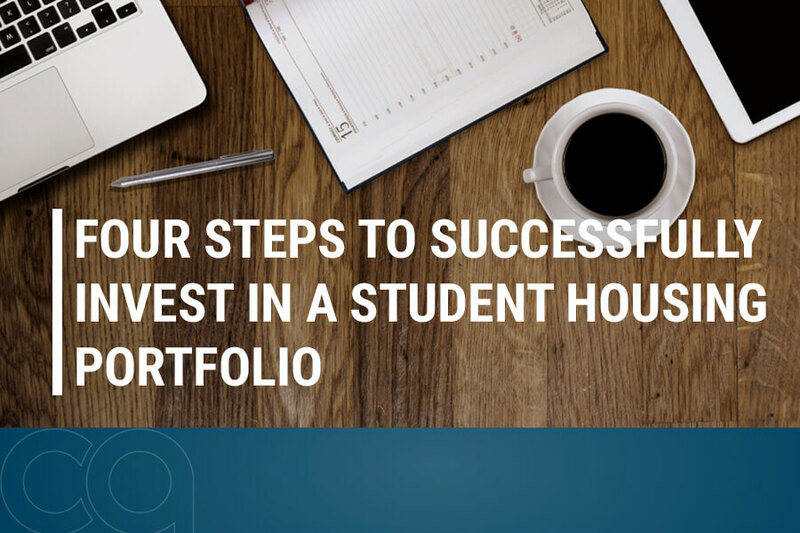 Similar to constructing a portfolio through one-off acquisitions, consideration should be given to diversifying risk within the student housing portfolio. Diversification can be achieved through variance in geography (exposure to state funding and demographics), asset type, distance to campus or rental price point. This also applies to how diversified the portfolio is in terms of revenue, NOI and invested equity. Knowing the drivers of portfolio-level income and value is important to achieving projected returns. Conducting good due diligence is key to the overall investment strategy. Understanding both the asset and the market are critical to underwriting the right strategy for the hold period, as well as setting expectations for short and long term capital needs and rent growth. In acquiring a portfolio, it’s critical to have an experienced team with the bandwidth to be in multiple markets at the same time, maintaining the same level of analysis and ensuring that the quality of the due diligence materials and efforts are uniform at every asset. While a 30 day due diligence period is typical for a single property acquisition, it is not uncommon for large portfolios across many states to be allowed only 45 days. The resulting compressed timeline requires having predefined due diligence processes and procedures to enable execution of a high quality, thorough review. While the transition of any student housing asset can be disruptive to performance due to the operationally intensive nature of the asset class, this is magnified when transitioning multiple properties simultaneously. Similar to due diligence, well defined processes and procedures are needed to ensure as little disruption as possible to operations. To that end, investors who align themselves with operating partners from the beginning of a transaction through due diligence give themselves a distinct advantage versus bringing in a new management company solely for the transition. Managing capital on a portfolio involves leveraging contractors that can travel to different locations. There is benefit to working with national contractors that have a track record of quality work, versus going into each individual market to identify a local tradesman. The capital management team should be involved early in the acquisition process to identify and prioritize capital needs for the properties, so they can identify the appropriate contractors to engage, and plan for the work ahead before the acquisition is final. Additionally, working with site level staff at each property during due diligence can elicit information that is critical to the investment strategy. The on-site team is often well-versed on the potential opportunities that exist at an asset, as well as potential threats. Conducting interviews with the team and asking the right questions is critical. When lacking a breadth of student housing experience in-house, or the staff to scale across a portfolio for due diligence, consider working with a consultant or a student housing investment management firm to help confirm expectations of both capital investment needs and meet or exceed expected investment returns.